With an international background and education (Kenya, U.K. and U.S.A.) as well as work experience on five continents, Smruti partners with top-level executives and CEOs. Her services have been delivered to a breadth of industries that include organizations such as The Tata Group, Diageo, Standard Bank, Bristol Meyers Squibb, Coca Cola, Cargotec, Western Union and Royal Mail. Smruti’s diverse client list of leaders she coaches individually includes CEOs, executives, lawyers, entrepreneurs and commanding officers in the U.S. armed forces. She is also repeatedly hired as a coach by organizations such as Deloitte and Georgetown University for their MBA and Executive Leadership programs. 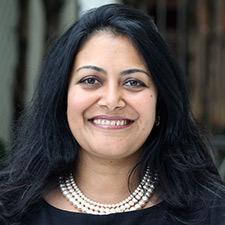 For a number of years Smruti practiced as an attorney at law firms in the U.K. such as Hogan Lovells and specialized in litigation and private wealth management. These experiences provided her with a results-oriented outlook and a deep understanding of the legal culture and the law firm environment. In the business world, through her years of experience with CEB’s premier business unit, the Corporate Leadership Council (CLC), Smruti has partnered extensively with Fortune 500 companies and Global 1000 organizations resulting in an advanced knowledge of international HR best practices particularly in high-potential development and succession management. She co-authored and managed the production of a 70 page research book titled “Upgrading Organizations’ Talent Management Strategies”. Smruti has delivered speeches internationally on influencing without authority which she refers to as a master skill. A recent article on the topic was published in the prestigious Washington Bar Association’s newsletter. She is also specializing in conflict coaching. Additionally, Smruti has a wealth of business, political and cultural insights into Eastern Africa from her continued engagement with clients in the region and she is published in the financial press. Her contribution as a speaker, facilitator and moderator is consistently sought out on the nexus of business and leadership. In 2016, Smruti moderated a roundtable on women’s leadership at the US Africa Business Summit in Ethiopia and spoke at the Wharton Africa Conference. She also forges mentoring relationships with young entrepreneurs and students in Kenya with a view to help them develop as leaders. Smruti is multi-lingual, of Indian descent and her family has been living in Kenya for nearly a century. She grew up both in Nairobi and London and has lived in Washington, D.C. for several years. In 2009, Smruti launched her leadership development practice with a mission dedicated to “enabling leadership potential worldwide.” She is the owner and Principal at Nexus Vision and can be reached at both, smp37@georgetown.edu and spatel@nxsvision.com. The website is www.nxsvision.com.